Robert Mugabe was on Saturday declared the winner of Zimbabwe’s presidential election with 2,110,434 votes, giving him 61% of the total and Morgan Tsvangirai 34%. The margin was enough to avoid a repeat of the runoff in 2008. The MDC will boycott government institutions and “pursue peaceful, legal, political, constitutional and diplomatic remedies”, including in court, he added. It called on African and regional bodies to meet urgently to restore legitimacy in Zimbabwe and demanded a fresh election as soon as possible. He denied that the result raised questions over his leadership. “We did not lose this election. We won. It is the imagination of Zanu-PF that they’ve won it, yet they know the truth. This is not a personal issue, this is a national issue. If the MDC lost this election, then it is not Tsvangirai who has lost. In the short term, there is the question of an appropriate response to an election that caused no reported deaths and is likely to be ratified by African observers. The MDC and independent watchdogs alike claim it was rigged with brilliant subtlety and sophistication. “They have transformed this election from the margin of violence to the margin of error – from the baton stick and machete to the desktop,” said MDC secretary general Tendai Biti. William Hague, the foreign secretary, expressed “grave concerns” about the conduct of the vote. Zanu-PF has dared the MDC to challenge the result in court, but it would face judges appointed by Mugabe. An alternative is mass protest. The MDC’s final “crossover rally” drew an estimated 100,000 people. Few in the optimistic crowd guessed that the “crossover” would be into potential oblivion. Yet there is scant sign of those thousands taking to the streets in an Egyptian-style uprising against Mugabe’s 33-year rule. Tsvangirai has survived beatings, arrests and assassination attempts, including nearly being thrown from a 10th-floor window. He has tried and failed to dislodge Mugabe three times, although supporters argue that, on a level playing field, he would have won every time. In 2008, the presidency seemed in his grasp when he beat Mugabe in the first round, only to withdraw from a runoff, citing violence against supporters that left more than 200 people dead. Tsvangirai became prime minister in a coalition government and believed he could win outright this time. Instead, the party has lost many parliamentary strongholds. 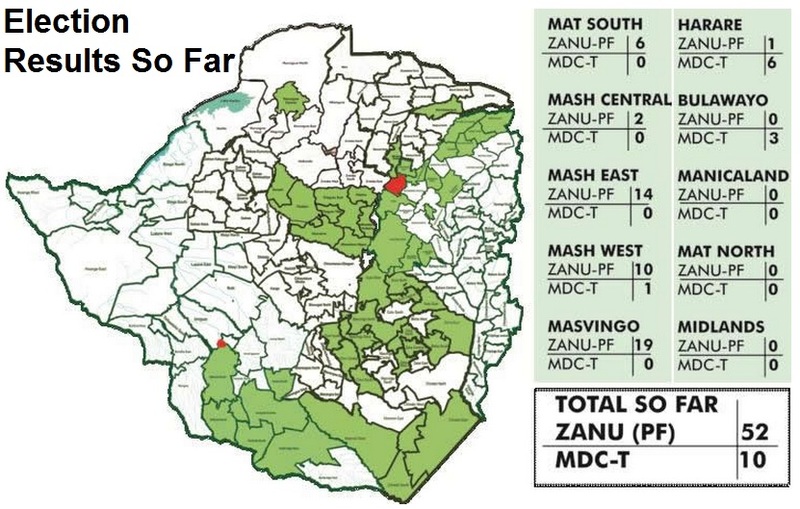 Results so far paint the electoral map Zanu-PF green, with only a few pockets of MDC red. Whatever the degree of any rigging, some believe Tsvangirai was a weak leader who let the MDC become tarnished by corruption and made careless choices in his search for a wife. Petina Gappah, a writer and political commentator, admitted being among the sceptics who had written the MDC off at the start of the year. But she added: “A lot of people are pointing fingers at Morgan, but nobody could have prevented this. Born from the labour movement in 1999, the MDC has never been allowed to forget that white people were conspicuous at its beginnings. Zanu-PF still paints it as a puppet of western imperialism, although the crowd at last Monday’s rally was 99.9% black. MDC members have been murdered, tortured and jailed during a long struggle and the prize now seems further away than ever. The party is at a crossroads, mindful that for decades opposition movements have made little headway against liberation governments in neighbouring Botswana, Mozambique and South Africa, although Zambia has seen democratic transfers of power. Bennett even predicted that an MDC “armed wing” could emerge to take on Mugabe’s “military junta”. But as police maintained watch on people shopping and strolling in parks, Zimbabwe seemed to be illustrating the idea that nothing, like something, happens anywhere. Chiredzi North Chapfidza Josphat MDC-T #DIV/0! Chiredzi North Mukwena Robert ZANU (PF) #DIV/0! Chiredzi North Shoko Bothwell Lucent MDC #DIV/0! Masvingo South Haruchenjerwi Action INDEPENDENT #DIV/0! Masvingo South Matongo Lovemore MDC-T #DIV/0! Masvingo South Mzembi Walter ZANU (PF) #DIV/0! Masvingo South Zhou Ruth MDC #DIV/0! Chirimanzu Masendeke Fransico M. MDC-T #DIV/0! Chirimanzu Munhende George MDC #DIV/0! Chirimanzu Pedzisai Innocent ZANU (PF) #DIV/0! HARARE, Zimbabwe—The African Union presented a mixed report Friday following Zimbabwe’s election this week, declaring the election free and fair but with a number of caveats. In a report read of by Mr. Obasanjo’s deputy, Aisha Abdullahi, the AU also cited a number of other issues primarily around voter registration, a high number of voters who needed voting assistance, and lack of transparency around getting access to the voter-registration list ahead of the election day. The outcome of Wednesday’s election will decide whether 89-year-old President Robert Mugabe extends his 33-year control of the country since he was first elected at Zimbabwe’s independence, or whether Morgan Tsvangirai, a 61-year-old former union leader who is running on a platform promising change and more investment, can wrest control. Early results announced by the Zimbabwe Electoral Commission for seats in the House of Assembly show Mr. Mugabe’s Zanu-PF in the lead, with 52 of the 62 seats announced so far going to the party, out of the 210 seats. A number of representatives from the Movement for Democratic Change—Mr. Tsvangirai’s party—lost their seats, including Douglas Mwonzora. “We don’t accept the results of this election…the results were full of fraud,” Mr. Mwonzora said, adding he saw plainclothes security forces at his own polling station helping voters cast their vote and influencing how they voted. Mr. Tsvangirai on Thursday lashed out at the election, calling it a “sham” and a “fraud.” Mr. Mwonzora said the party is holding a meeting Friday to determine how they will respond to the outcome. Spokespeople for Zanu-PF have denied the allegations of fraud and vote rigging and said the elections were carried out freely. The AU’s Mr. Obasanjo said he couldn’t comment on Mr. Tsvangirai’s allegations, and said the regional organization will continue to monitor the outcome of this week’s vote. He praised the “general” peaceful and intimidation-free environment leading up to Wednesday’s vote. After the 2008 election, around 200 people died in political violence and observers hope to avoid a repeat of that. “In comparison to 2008, Zimbabwe has made a transition,” Ms. Abdullahi said. The ZEC said vote counting had been completed at the 9,000 polling stations and that it was compiling all the results. Rights groups and election observers aren’t the only people keeping a close eye on the outcome. The 2008 violence also accelerated a downward spiral in an economy already crippled by high unemployment and skyrocketing inflation. The economic decline was halted in 2009 only when officials abandoned the country’s currency for the U.S. dollar and formed an awkward coalition government with Mr. Mugabe as president and Mr. Tsvangirai as prime minister. Investors are waiting to see how the election is resolved and what kind of policies are pushed. Video: Were elections free and fair in Zimbabwe? PRESIDENT Mugabe and Zanu-PF are headed for a landslide on the scale of the 1980 harmonised elections, amid reports the revolutionary party had made clean sweeps in six out of the country’s 10 provinces. In the remaining two provinces outside Harare and Bulawayo, Zanu-PF garnered more than 50 percent of the constituencies on offer. Official results released by the Zimbabwe Electoral Commission and information sent in by our news crews countrywide shows Zanu-PF making a clean sweep of Masvingo, Mashonaland East, Mashonaland Central and near clean sweeps of Mashonaland West, Manicaland and the Midlands where it is reported to have fallen short of the “upon upon’’ exhorted by its First Secretary and President, Cde Mugabe by single constituencies apiece. Though full official results were still to be confirmed, results released by ZEC from 62 constituencies showed that Zanu-PF (represented by green on the map) had claimed 52 seats, while MDC-T (red) had managed 10. More results will be released today. Information gleaned from candidates and polling centre returns showed Zanu-PF making serious inroads into Harare where it garnered over a third of the vote, bagging six constituencies, up from the solitary Harare South it had consistently defended since the advent of MDC-T at the turn of the millennium. Several MDC-T heavyweights fell by the wayside, among them Jameson Timba, Theresa Makone, Elton Mangoma, Douglas Mwonzora, and Giles Mutsekwa. Countless surveys ahead of the elections from organisations as diverse as the US think-tank Council on Foreign Relations, Freedom House, Afrobarometer and pollsters like the Mass Public Opinion institute, MDC-T allies among them the NCA, Concerned ZCTU Affiliates, Sokwanele, and Zimbabwe vigil and media organisations like the New York Times, the Guardian, the Independent and the leftwing magazine Counterpunch had all pointed to a Zanu-PF victory. On the eve of polling, reports emerged that the US State department had gagged Freedom House from releasing its latest survey results that indicated a crushing victory for President Mugabe and Zanu-PF in harmonised elections. The Freedom House survey gave President Mugabe a 10 percent lead over Mr Tsvangirai and predicted a two thirds majority for Zanu-PF in the National Assembly where the revolutionary party was tipped to garner at least 140 seats in the 210 seat assembly. From our indications, the embargoed survey was spot on as far as the two-thirds majority but just fell short on the margin of the presidential vote amid indications President Mugabe is likely to prevail by more than 70 percent of the votes cast, which is throwback to the 1980 plebiscite to which the harmonised elections have been likened that had Zanu-PF garnering 57 out of the 80 black roll seats, while PF-Zapu garnered 20 with Bishop Abel Muzorewa’s UANC which managed three seats. Zanu-PF’s stunning performance in the key swing provinces of Manicaland and Masvingo drove the numbers. Our crews indicate that Zanu-PF swept all 26 seats in Masvingo up from the 12 the party garnered in 2008, while in Manicaland which was reported to be riven by internecine fighting ahead of the elections, Zanu-PF rose from a paltry six seats in 2008 to 22 out of the 26 on offer.